Long after the hits have died out, long after the heyday of the Tijuana Brass, Herb Alpert has earned a niche as a serious jazz musician. While Alpert has always had respect as a horn player, sometimes his choice of material has been suspect in the eyes of jazz aficionados. Of late, he has come back closer to the mainstream of straight-ahead jazz, and "Midnight Sun" continues that trend with covers of standards such as the Gershwin classic "Someone to Watch Over Me," Lerner and Lowe's "I've Grown Accustomed to Her Face," and "Mona Lisa." In addition to his usual high standards of blowing, Alpert also turns in a very nice, Tony Bennettesque vocal on "I've Grown Accustomed to Her Face." While his tone on horn is as bright and sassy as ever, his vocal is darker, more introspective. A real treat is the inclusion of "Friends," recorded with the late, legendary saxophonist Stan Getz in 1990 for a project which never came to pass (the two also collaborated on Getz' 1990 swan song, "Apasionado"). One also discovers, in a slower rendition of his massive Tijuana Brass hit "A Taste of Honey," that Alpert has not turned his back on some of his most productive  and lucrative  years. 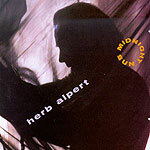 This warm reading of his own past shows that if Alpert is more attuned to jazz than pop in his autumn years it is not out of a need to prove himself or distance himself from his more pop-oriented material, but simply because the jazz is what he now feels and what he needs to play in order to express himself.